SANTIAGO, Chile, Jan. 17, 2019 /PRNewswire/ — Bechtel, a global leader in engineering, procurement and construction, has received approval from Teck to proceed with the expansion of the Quebrada Blanca copper mine in Chile, comprising a143,000 tonnes-per-day copper concentrator, a high-capacity desalination plant, and a 165-kilometer water supply pipeline. The Quebrada Blanca Phase 2 project (QB2) is located in the northern Chilean Andes, 4,300 meters above sea level and approximately 145 kilometers from the Pacific Ocean. Bechtel will be responsible for the engineering, procurement and construction management (EPCM). First production is targeted for the second half of 2021 and QB2 is expected to generate 316,000 tonnes of copper-equivalent production per year for the first five full years of mine life. “We are very proud to be working with Teck to develop the Quebrada Blanca Phase 2 Project. Working together with Teck we have developed a capital efficient design and, in the field, we will be applying innovative productivity methodologies to deliver the lowest possible construction costs in Chile. The project offers a great opportunity for Bechtel and Teck to deliver industry best results building the largest copper project in Latin America,” said Paige Wilson, president of Bechtel’s Mining & Metals Global Business Unit. Bechtel’s global experience includes delivering more than 40 major copper projects, as well as other major projects in the mining and metals industry, and a 60 percent increase in copper production capacity in Latin America over the last three decades. 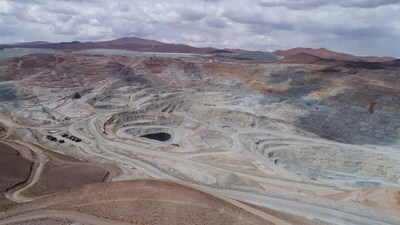 The QB2 project is owned by Compañía Minera Teck Quebrada Blanca SA (QBSA), which upon closing of the recently announced transaction will be indirectly owned by Teck (60 percent), Sumitomo Metal Mining Co., Ltd and Sumitomo Corporation (30 percent), and Enami, a Chilean State agency (10 percent). Bechtel has worked with Teck since 2011, including on development of the studies for the Quebrada Blanca mine expansion, which received approval for its social and environmental impact assessment in August 2018.